Homeless residents Patricia Hollenbeck, left, and Gina Whitten clean an abandoned camp Monday west of Durango. They were members of a small group that filled 13 bags of trash from a single abandoned campsite. A handful of homeless campers living west of Durango hope to earn the right to stay where they are, rather than be displaced again. Gina and Brian Whitten and Patricia Hollenbeck cleaned up one of the most egregious abandoned campsites Monday afternoon north of the Tech Center, filling 13 trash bags with camping gear, plastic bottles, empty food cans, electronics and other refuse. 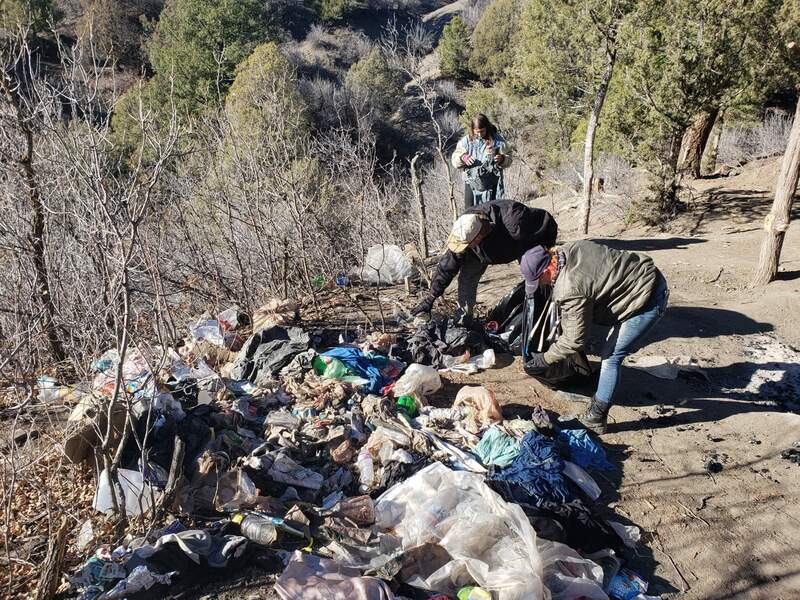 The campers said they planned to clean up the three other trashed areas they were aware of, in hopes the La Plata County Sheriff’s Office might consider allowing them to stay. “Getting it done should be evidence that we are trying,” Brian Whitten said. The campers said they were unaware of how trashed some of the campsites had become until Sheriff’s Office deputies visited the area Nov. 16 and told all the campers to leave because of the mess. “It makes me sick to my stomach. ... We came unglued and said, ‘We have got to do something,’” Hollenbeck said. Since the deputies visited, some campers have moved on to other public lands, Hollenbeck said. There are between 10 and 15 people who stayed, she estimated. 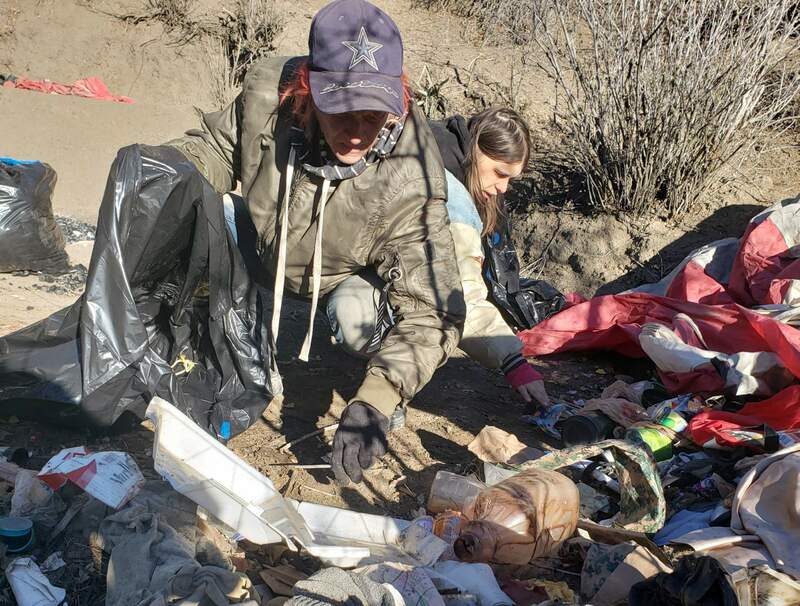 Patricia Hollenbeck, front, Brian Whitten, center, and Gina Whitten clean an abandoned campsite Monday west of Durango. Sheriff Sean Smith said the county posted numerous “no camping,” “no littering” and “no fires” signs this summer after closing a sanctioned campsite west of downtown Durango. “We had obviously taken steps to notify campers that they are not allowed to be up there,” he said. Allowing camping west of town is untenable because of the fire danger and public safety concerns, he said. Medics and law enforcement cannot easily access the area if someone gets injured or a crime is committed, Smith said. “The county’s goal is to not have that up there again,” he said. But the La Plata County attorney, Smith and other county staff plan to meet Thursday to discuss homeless camping and the legal questions surrounding it. County commissioners, the county manager or the assistant county manager can decide if and where camping on county lands may be allowed, county spokeswoman Megan Graham said. Earlier this year, a panel of federal judges with the 9th Judicial Circuit Court found outlawing sleeping on public property when people have nowhere else to rest is unconstitutional. Doing so is cruel and unusual punishment, the court found. Most of the campers who remain west of town are committed to keeping camps as clean as possible, said Gina Whitten, who works at McDonald’s. The Whittens and Hollenbeck have plans to move into permanent housing, but they would like a consistent place to stay until then. “We’re not an infestation of parasites; we’re people,” Gina Whitten said. mshinn@durangoherald.comThis story has been updated to correct that La Plata County Sheriff Sean Smith plans to meet with the La Plata County attorney not county commissioners. The story has also been updated to clarify that either commissioners, the county manager or the assistant county manager can decide if and where camping is allowed on county property.